Sometimes a new capability is introduced in an update and even if you go through every detail you may still miss out on the little gem. Simply to provides you with the Sign-In logs of unsuccessful sign-in attempts so that you can troubleshoot the process. 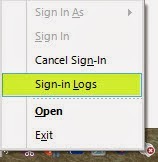 If the window states “no sign-in data available” that’s simply because the sign-in process was successful. In my example here you will see 2 reported errors. The first states a trust issue and the second mentions that the client isn’t authorized. The underlying cause, invalid credentials.